Ah, truffles. It all sounded sooooo easy. And then it went awry. Cattywompus. Sideways. You see, sometimes I can be very crafty. I've been known to make really pretty cookies, and I've built a few interesting gingerbread houses. But sometimes the results just don't live up to the vision in my head. It's like scarves. Other people can randomly throw a scarf around their neck or drape it over one shoulder and they look fashionable. No matter what I do, it looks like I tried to hang myself and it didn't work. So when Oreo contacted me and said they wanted me to make their classic cookie balls and decorate or change them, I thought it would be simple. Truffles are round things. They lend themselves to all sorts of interesting designs. I had ideas and ideas and ideas and ideas. So I made that. They were really good. Addictive, even. I mean, it's Oreos and cream cheese and chocolate. How can it not be good? So I nibbled and thought and nibbled and thought. How could I decorate them? How? And I thought and thought. And maybe nibbled some more. I had this idea about making them look like presents, but my round balls weren't all that smooth. 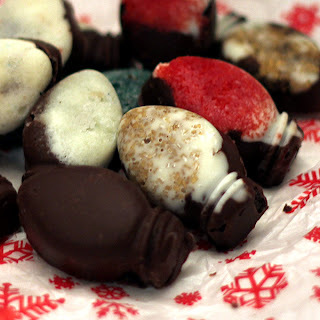 Then I thought about sticking colored chocolate chips all over them and making them look like ornaments. That sounded doable, yet messy. And since I couldn't figure out a way to hang a truffle "ornament" of course I put it on a stick. Because everything on a stick is better, right? Um, no. It looked like a mace. No, not mace, the spice. It looked like one of those pointy clubs. Yup, nothing says "holidays" like an ancient weapon of war. So, back to thinking. And then the light bulb lit. Literally. I was shopping and I saw this adorable silicone pan for making things in the shape of those big Christmas tree lights. Aha. It looked like the truffles would fit perfectly in there. So, now we come to one of my mom's infamous sayings. Do as I say, not as I do. Because while what I did worked, it wasn't the easiest or most efficient way of doing things. You see, since I already had my truffles made, I made the lightbulbs sort of backwards - putting colored sugar in the bottom, white chocolate chips on top, heating that in the microwave to soften the chips, then gently warming the already-made truffles and shoving them into the pan. It worked well enough, but a better thing to do would have been to melt the chocolate in the light bulb pan, then build the truffle right there in the pan. Then add a layer on top to cover the soft truffle filling. Yeah, that would have worked so much better. Maybe next time. I've already eaten a few too many of these things and the rest of the Oreos I have stashed are for another use. As far as the sprinkles, maybe next time I might brush the finished truffles with a little melted chocolate and sprinkle the colored sugar on top. Or maybe just use colored chocolate. Or ... hey, I've got plenty of time to perfect this before Christmas, right? Have you made these? How would YOU change them? This post was sponsored by Oreo, but all words (except their recipe) are mine. But I probably would have attempted this anyway. Because I'm crazy like that.